The concept on skip counting by 12’s or twelves is an essential skill to learn when making the jump from counting to basic addition. 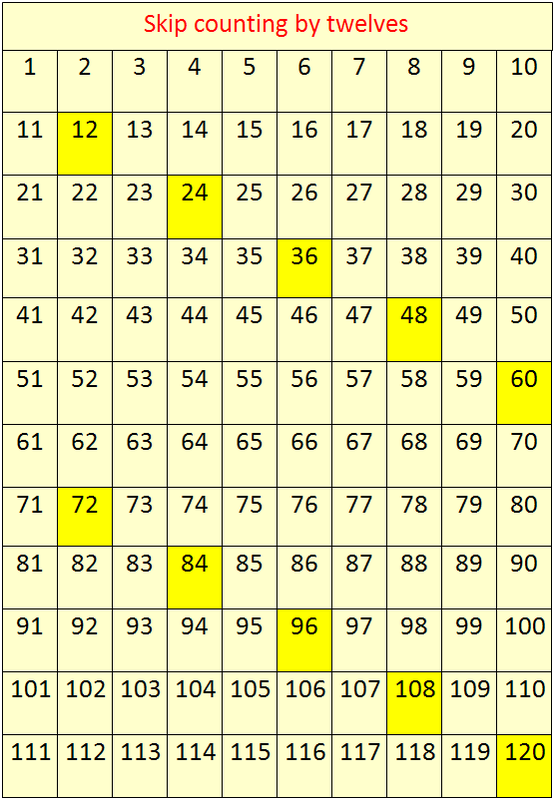 The sequence chart will help us to write the number to complete the series which involves skip counting by twelves up to tens times. (i) 24, ____, ____, 60, ____, ____, ____, 108. (ii) 0, ____, ____, 36, ____, ____, 72, 84. (iii) 72, ____, ____, ____, ____, 132, 144. (iv) ____, ____, ____, ____, 96, ____, ____, 132. (v) ____, ____, ____, 48, 60, ____, ____. (vi) 72, ____, 96, ____, ____, 132, 144, ____. (vii) 36, ____, ____, ____, 84, ____, ____, 120. (viii) ____, 24, ____, ____, ____, 72, 84, ____. (ix) ____, ____, 36, 48, ____, ____, ____, 96. (x) ____, ____, 72, 84, ____, ____, ____, 132. II. (i) 24, 36, 48, 60, 72, 84, 96, 108. (ii) 0, 12, 24, 36, 48, 60, 72, 84. (iii) 72, 84, 96, 108, 120, 132, 144. (iv) 48, 60, 72, 84, 96, 108, 120, 132. (v) 12, 24, 36, 48, 60, 72, 84. (vi) 72, 84, 96, 108, 120, 132, 144, 156. (vii) 36, 48, 60, 72, 84, 96, 108, 120. (viii) 12, 24, 36, 48, 60, 72, 84, 96. (ix) 12, 24, 36, 48, 60, 72, 84, 96. (x) 48, 60, 72, 84, 96, 108, 120, 132.